God we believe is God who calls. When you read this scripture, you will encounter many stories of people, and these stories all talk about calling. God called Abraham, Moses and the prophets. When God called Abraham, Abraham did not even question. Immediately, he obeyed God’s calling and left his home to go to a place where God called him to go. When God called Moses, it was a little bit different. Moses was resistant. He said, “I cannot speak. I’m not eloquent. I cannot go.” God continuously called him to go and at the end he said, “No, I can’t really go, so send my brother Aaron.” So it was very different from Abraham. Abraham did not even question, he immediately left his home and went to the place God called. Moses was resistant, but in the end he accepted the call from God and lived out that calling for 40 years, the last 40 years of his life. Very different response, but it has to do with calling. And also prophets too. When God called Jeremiah, Jeremiah said, “I’m too young to do anything that you ask me to do,” and when God called Isaiah, Isaiah said, “I’m a man of unclean lips. How can I preach your Gospel or good news or message?” All these people responded differently, but their life was to do with the call from God. When it comes to the New Testament, same thing. God called the ordinary fisher people, fishermen, and God called them. “You follow me,” and they left the net and then followed Christ. When God called, when Christ called, Paul, on the road to Damascus, it was a supernatural experience, but he received a call and lived out God’s call all throughout his life. For example, Jonah the Prophet who we studied last year, God called him and he ran away. So, very different, but it’s all to do with God’s call. Very interesting. Their lives were intricately connected, with a call. To all these people, life and calling could not be separated. There was no arbitrary division between their personal life and their life of calling. Their life was to fulfill the calling that they received. Does God Have My Number? I wonder, is there a call in life? Or do I make my own life? What is life that we live? Is there a call that we respond to? Versus “I don’t know about any callings, I’m just busy making my own life.” What is it? Are we so different from the characters in the Bible? Only they got called and God doesn’t call anymore in modern days? Or is calling still a relevant concept to understand my life? I still believe that callings are very much relevant to my life and to our life. That’s what I want to tell you today. It is wonderful to see that your life is connected with a bigger picture, and I believe that your life is connected with a bigger picture. Your life does not end where you are. It is connected with God’s greater plan. Whatever you do right now has some implication for God’s greater plan. When you have this sense of connected-ness, you will understand that you’re not alone. You don’t have to figure out everything that is going on in your life. You don’t have to solve every problem that you encounter in your lives on your own. You are connected with God and God is with you to help you to work out your life. That was what all these people in the Bible experienced in the background of their lives. They experience that there’s God. In the background of your lives, there is God. You may not necessarily see God, you may do all these things on your own, but in the background of all that you do, there is God. And this God knows you very well. When you read the scripture Samuel, the scripture says, “Samuel did not know Jehovah yet. Samuel did not know God yet, and yet God knew Samuel’s name.” And he knew exactly, “You are the one that I have chosen and I want you to do this.” God knew Samuel when Samuel did not even know God. God knows all of us. God knows all of us better than we know ourselves. God knows your struggle, your hurt, your pain, your longing, your weaknesses. God knows all about us, and he will give us what we need. To live a life of calling, we need to be able to hear that calling. We need to be able to hear the voice. We need to be attentive to the voice of God. 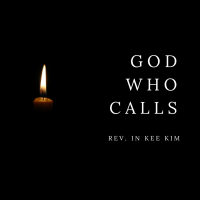 And I believe that there is a voice of God in our lives, not necessarily audible voice – if you hear them, maybe you may see Joe Park – it may not be audible voice, but I believe that we hear God’s voice. And we try our best to live out that voice that speaks to us. That voice is what inspires us, what prompts us, what gives us conviction. Life is not about a whole bunch of your decisions and your schedule. There are sometimes that you have this urge. This voice nudges you. Sometimes uplifts you. Sometimes speaks to you very clearly like, “Hey, this what I want you to do.” I believe that there is a voice. We just ignore it a lot of times. As we respond to what nudges us, our life is slowly moving towards God’s wonderful plan for you and for the world. And it’s very important to hear God’s voice every day. God said to Samuel, “Then the Lord said to Samuel, see, I’m about to do something in Israel that will make both ears of anyone who hears of it tingle.” Does it tingle right now? It’s a very dramatic way or graphic way of listening to the voice of God. It may not be physical tingling, but the tingling of your heart. And it’s not always easy to hear God’s calling. God had to call Samuel three times. Samuel could not understand. Eli must’ve been really upset or frustrated. In the middle of the night this boy comes in and says, “Did you call me?” And he woke him up and “No, I didn’t call you. Lie down,” and the next night, “Did you call me?” Three times! It was hard to hear God’s calling sometimes. You know, when I read that part of the story, I was reminded of Paul. Paul said he prayed because he had thorn in the flesh and he prayed three times for the thorn to be removed. That three times did not mean that he only prayed three times. He prayed as much as he could, but God did not take out the thorn. So here too, God calls Samuel three times, but it’s almost like God called until he really hears it. God called continuously until he hears it, and finally he heard it with the help of Eli. God calls us sometimes and we don’t hear it. Why? Because we are so saturated with our own agenda. With my own plan. Or sometimes we’re too strong in our own will, or sometimes we’re too distracted, or sometimes we are too painfully hurt, and sometimes we are too proud and arrogant. And so, many times we don’t hear God’s voice. But God never stops calling us. God never gives up calling us. God continuously calls us. The way we started TBS, Tuesday Bible Study, I believe that it was God’s calling for me. It’s not what I planned. I was busy as I was and then few people came to me – they said they don’t go to church, but they wanted to have a Bible study. You don’t go to church, why do you want a Bible study? And they said, “Well, we don’t go to church, but we are still interesting in what the Bible really, really says.” “Oh, so you want to know what the Bible really says? Sure, I’ll help you.” So that evening at Knox College in that cafeteria, about 20 of us gathered together. And then one person said, “I’m an atheist,” and another person said, “I’m kind of Buddhist.” All kinds of people and they all wanted to have Bible study. That’s how I started. I didn’t know what God’s plan was, but God had a plan when He called me to start a Bible study. Now we have Pastor Simon here, working for our church from that group. WBS, same thing. Women’s Bible Study. I don’t know, more than 10 years ago I believe now, and a few women wanted to come. They came to me and they wanted to have a Bible study, so I responded to that call. I didn’t know exactly what would entail, what that Bible study might have entailed, and I realized last 10 years I’ve experienced them changing so much, and they had a profound impact on the church itself. Inner Voice, that was what God nudged me. Called me. At first, I didn’t have confidence, “Everyday? How? How can I do that?” And he said also to do it in English too. I thought I was going to just do Korean and then do the English one too? “What? I can’t!” But God never stops calling. I mean, I have planned this for three, four years. God gave me this idea three or four years ago and I said, “No, I can’t do it. I’m too busy.” And finally last year I responded to God’s calling. Prayer retreat or New Year’s retreat that we’re going to have… a few years ago, God gave us, gave me that calling. Let people start the new year with prayer, with a fresh spirituality. Let them start with that. “Lord. I’m so busy at the end of the year. You know, I have Christmas worship service and December 31st service and then I have to go to my family gathering and play games all night and all that stuff. I can’t prepare.” And He said, “Do it.” So I just responded. Happiness seminar is the same thing. My friends, God calls. God calls each and every one of us to respond to his call. It’s not just Bible people who heard God’s calling. Even now, God is calling all of us. Life is my response to God’s calling. It’s as simplest as that. Life is a response to the calling. Be attentive to God’s voice. Be by yourself, where there’s no distraction to that. Every day, be by yourself, where there’s no distraction. Quiet yourself down. Your worries, anxieties and fear, let all those down. Pay attention to God. Try to listen. You can do that. Life is more than your decision. There is something that comes to you from outside or from the depth of your heart. You need to listen to that voice that comes from the depth of your heart rather than just making schedules every day mindlessly and living it out. Instead of doing that, sit down and what voice comes from the depth of your heart. As you respond to that calling, your life will be enriched. Sometimes that voice makes you cry. Other times, that voice gives you new strength. And sometimes, that voice leads you to repent. And sometimes, God says, “You will be all right. Don’t worry. You’ll be fine.” When we hear God’s calling, we can be true disciples of Jesus Christ. We all go through hardships, uncertainties and difficulties. Don’t make yourself numb. Listen, and God will guide you… to a very, very good place. Green pasture. Only if you are able to hear that voice.